Welcome, this week how to encourage language development in your baby and October is Grandparents Month; to acknowledge the increasing role of grandparent carers we offer suggestions on how to negotiate a successful care arrangement with your parents (in law). Learning to talk is a skill that begins at birth. By the age of two, most babies have a vocabulary broad enough to begin to construct sentences and express their needs. However, a recent report has shed light on just how important this early conversation is for babies from birth to age three. This essential parent – child interaction builds the foundation for early literacy and language acquisition, as well as nurturing emotional and social wellbeing. According to our 2016 survey, 21 per cent of respondents are now using grandparents as a form of child care. And with child care places increasingly difficult to secure, this reliance on extended family child care is only set to rise. 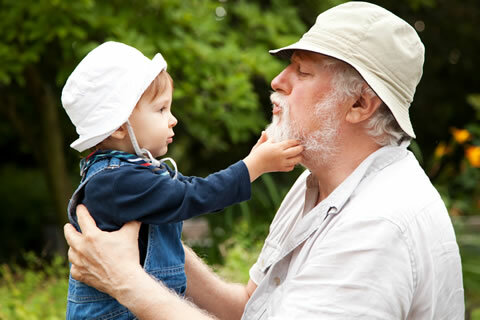 With National Grandparents Day this month (23rd October), it's a chance to celebrate and look at the important role grandparents play in the raising of children – as the saying goes: "Nobody can do for little children what grandparents do. Grandparents sort of sprinkle stardust over the lives of little children."